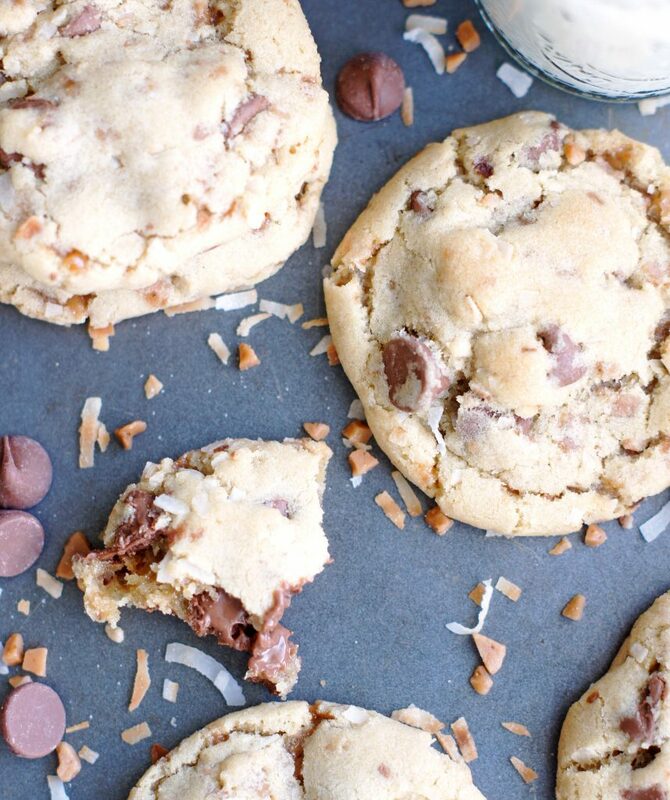 These Butterfinger Monster Cookies are ridiculously delicious! 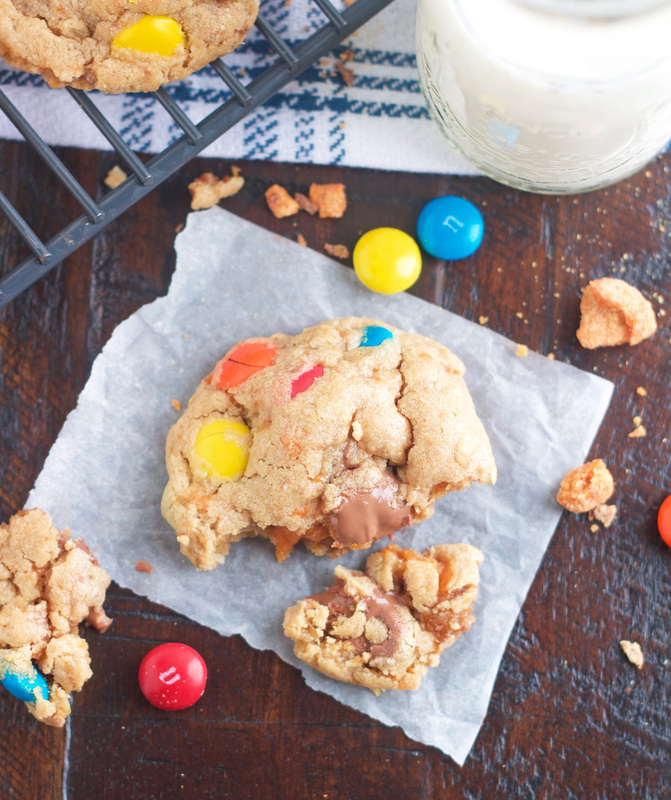 Made with peanut butter, oatmeal, chocolate chips, chopped Butterfinger and M&M’s. . . . What’s not to love? These are going to be an instant favorite! 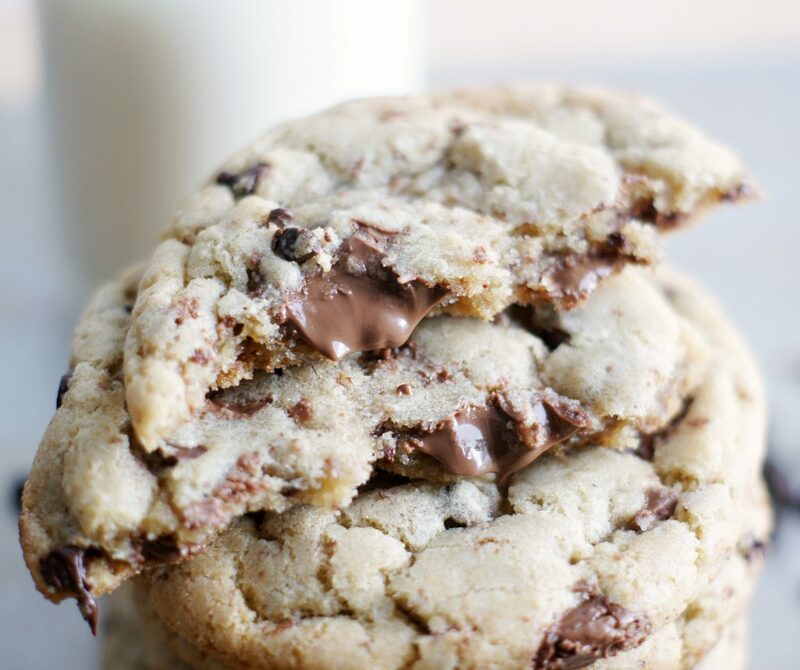 If you know me personally or have been following this blog for awhile, it’s a well-known fact that I love chocolate chip cookies and cookie dough. It really doesn’t even have to be strictly chocolate chip cookies either. Any cookie with chocolate chips, peanut butter, M&M’s, chopped candy bar, Oreos, toffee bits, etc. completely wins me over. I make cookies at least four times a week and I’m not ashamed to admit that sometimes I don’t even bake any of the dough, I just eat it and then make dough balls and put them in my freezer (no judging please). Hey, some people have to have their Diet Coke, I have to have my cookies and cookie dough. Now about these Butterfinger Monster Cookies. 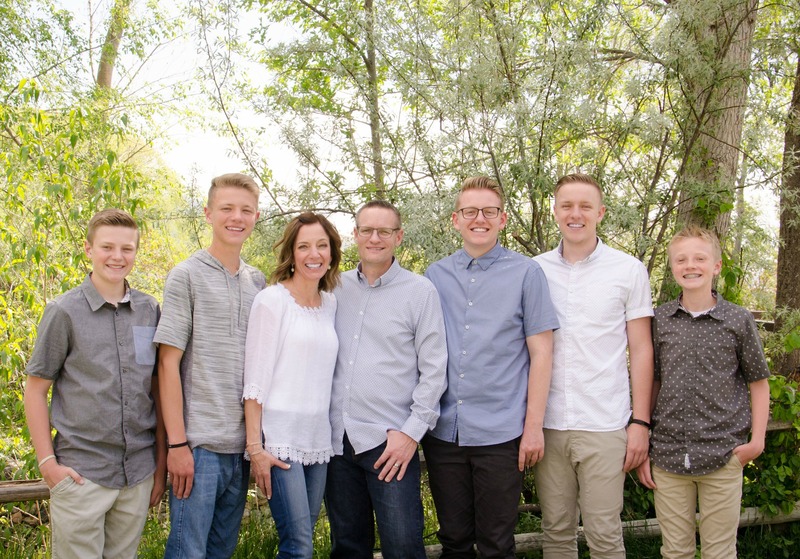 Just look at them, they pretty much speak for themselves. As if monster cookies aren’t all ready delicious enough on their own, but then I had to go and throw some chopped Butterfinger in, making them even more amazing. I’m not going to lie, it was one of the greatest decisions ever! Because we love these Butterfinger Blondies and Butterfinger Ice Cream, I always keep Butterfingers on hand so when that craving hits for either of them, I’m well-prepared. I decided to put some of those Butterfingers to good use and took one my favorite cookie recipes and tossed in lots of chopped Butterfinger. . . Ummm, hello crazy, delicious cookies! These might be one of my newest favorite cookies. Now I know I declare a lot of cookies to be my favorite, but being the cookie addict that I am, there is always room in my heart for more than one favorite. If you don’t have any Butterfingers or M&M’s, I highly recommend you run to the store and buy some ASAP because these cookies need to be in your kitchen. These cookies do not flatten out a ton, so if you want a flatter cookie, you can gently press down the dough balls with the palm of your hand before you bake them. You can also tap the cookie sheet a couple times on the counter after they come out of the oven, this will make them fall slightly. 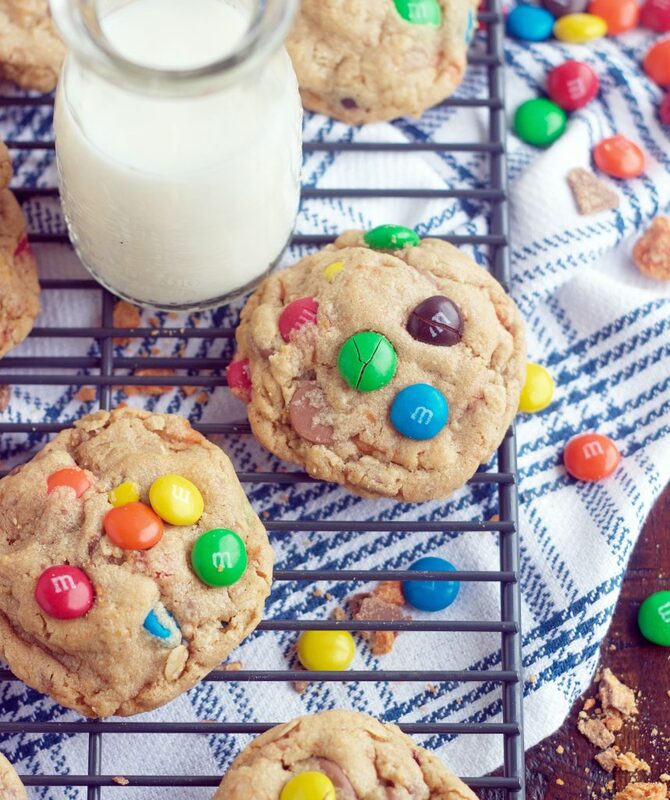 Make sure you stir the M&M’s in by hand so they don’t break into pieces. If you’re feeling lazy and don’t want to do that, just keep your mixer on low and turn it on for just a few seconds to stir them in. 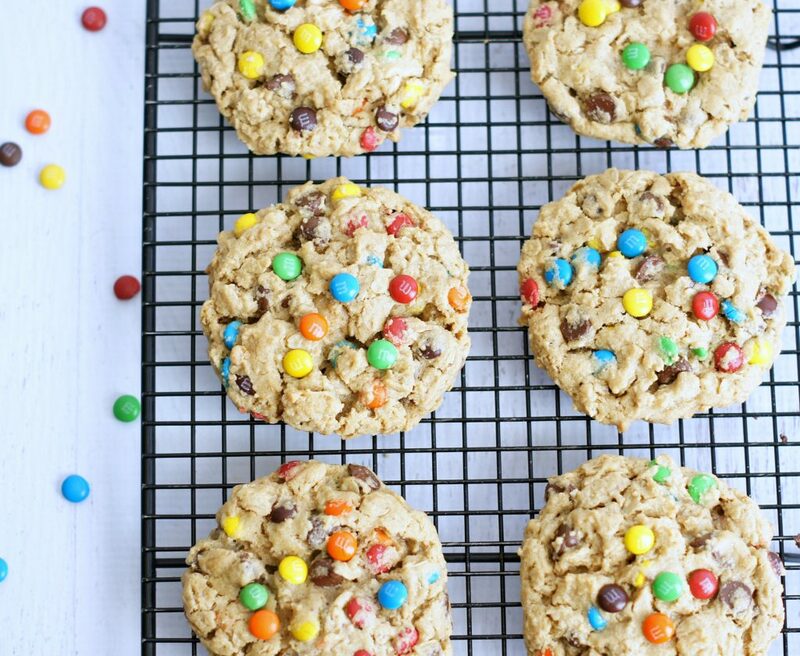 I like to add a few more M&M’s on top of each cookie before I put them in the oven to bake. In a large bowl, cream together the butter, brown sugar, and sugar. Add peanut butter, vanilla and egg, and mix until well blended. Add the flour, baking soda, baking powder and salt and mix until just combined. Add oats and mix until just combined. 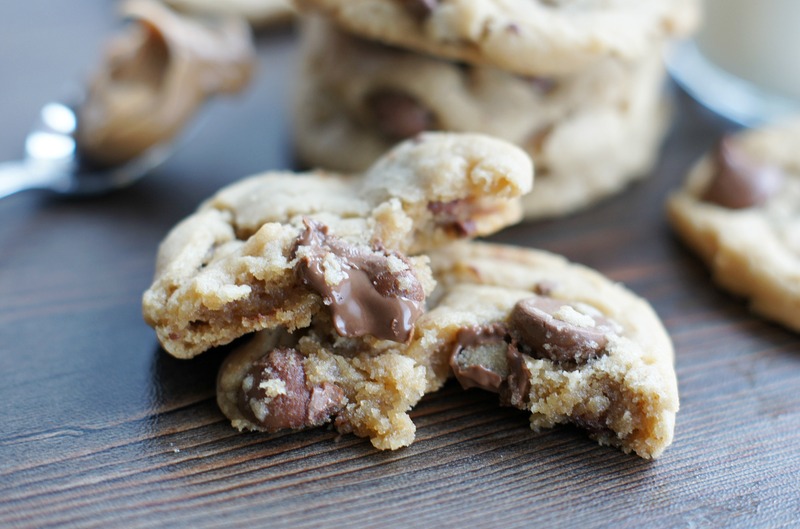 Add chopped Butterfinger and chocolate chips and mix on low until just combined. Add M&M's and gently stir in by hand. Remove from the oven and cool for 3 minutes, then transfer them to a wire rack. 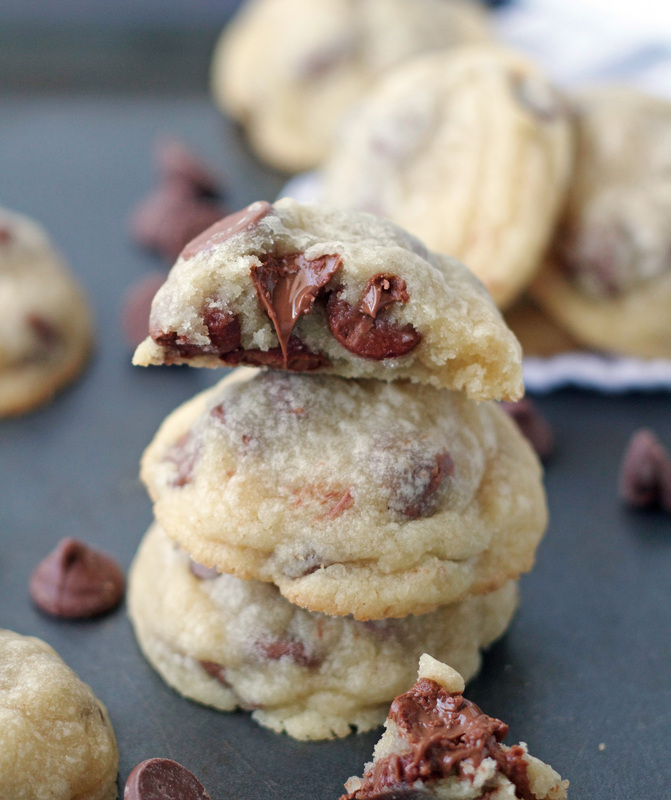 SOME MORE OF MY FAVORITE COOKIE RECIPES . . .